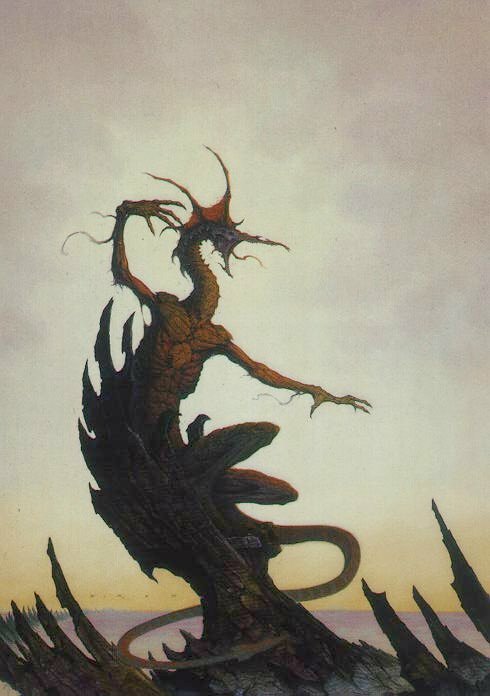 One of the great aspects of Dark Sun is that it turns typical campaign aspects on their head. In traditional campaigns, any large city can serve as a safe “home base” for the PCs, acting as a civilized “point of light” amidst dangerous things in the wilds outside. While the outside is incredibly dangerous in Dark Sun, the cities can be just as dangerous. It is as if evil has won, each city ruled by an incredibly evil dictator with godlike powers and an army of corrupt and vile people enforcing their will. The PCs are generally a threat to the established order. This is your home base. Welcome to the city-state. It remains to be seen how 4E will treat each city-state, but one of the neat aspects in previous Dark Sun editions was that each city-state had a very different culture, art, architecture, dress, favored weaponry/military, and even language or common names for people. These aspects were drawn from real-world countries and cultures. While that may seem unoriginal, in practice it meant it was easy to grasp (and often led players to learning more about these real cultures). In past editions, the similarities were very noticeable. The architecture would draw clear parallels to ancient versions of these cultures, there would be obvious bits like King Hamanu’s code instead of Hammurabi’s code, similar names such as Tyr/Tyre (Lebanon), etc. In role-playing an Athasian PC, it can be really fun to think about which city-state your PC hailed from (assuming you did not grow up in a village or out in the wastes) and how that influences your dress, culture, choice of weapons, etc. Did you grow up in Gulg and have multiple bone piercings in your lips and nose? Do you wear robes and wear a long braided beard like those in Urik? Do you favor blood sacrifice as someone in Draj might? Do you follow Hamanu’s code (such as an-eye-for-an-eye) strictly? Each city is ruled by a sorcerer king. It is incredibly difficult to amass the resources required for a city to exist. The near-absolute power of the sorcerer-kings, who are masters of the Way and of Defiling magic, makes these city-states possible. Each of the Sorcerer-Kings claimed or built these cities as Athas decayed and each guards the secret of how they came to be and why the world became what it is today. In addition, each Sorcerer-King protects inhabitants from the most feared creature on Athas: the Dragon of Tyr. Near mythical, it is said the Dragon of Tyr claims thousands of lives at a time and that only the Sorcerer-Kings hold it at bay. 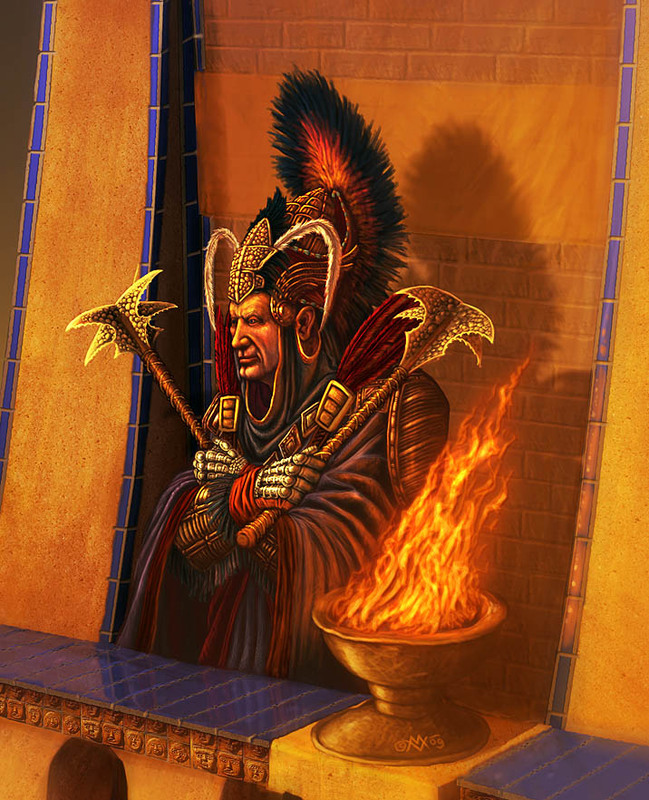 Sorcerer-Kings rule their city from a position of great strength. In addition to their own formidable powers, they generally rule from a highly protected citadel within the city-state. They have large standing armies of trained soldiers and slaves. Their edicts and order are enforced by their Templars, which are priest-enforcers that preach their will and brutally enforce their laws. Many of the templars receive powers directly from the Sorcerer-Kings, causing many Athasians to conclude that the Sorcerer-Kings are gods (a belief the SKs actively foster). The city-state itself is usually fortified – with so many precious resources, another Sorcerer King could easily decide to attack another city. In fact, ruins suggest this has happened in the past! City-states usually have a large palace or compound, as well as bureaucratic or temple-like structures for the Templars. These areas are almost always off limits to the average Athasian. Outside of the city there are often large areas of land farmed by wealthy noble families. In direct contrast, most city-states have slums of varying kinds where the poor live. Several large and many small slave markets exist, as well as trade wards sanctioned by the Sorcerer-Kings and overseen by the (often corrupt) Templars. Social life often revolves around a city’s gladiatorial arena. Blood sport pits gladiators against each other, often in varying teams, and often to the death. Monsters are sometimes brought in as a special spectacle against expert gladiators, while introductory matches might pit would-be-gladiators against unlucky slaves that have been sold (for the last time) by their owner. The arena dominates the imaginations of many. Does your PC wonder how they would do in the arena? Did they ever compete? If so, how did they manage to leave? Only a few slaves or owned gladiators are able to win freedom. Though they like to think their rule is supreme and unquestionable, the Sorcerer-Kings cannot be everywhere at all times. Nobles in some cities have some measure of power. The Elven markets offer illegal or cheap (and sometimes questionable) goods. While it can be a way to circumvent the will of the Templars, the elven market and its often duplicitous merchants can also lead someone to be swindled or even meet their end in a darkened alley. Some say the elven market serves the needs of the Sorcerer Kings and that the Templars tolerate the existence for their own dark reasons. The layout of each city is as unique as the laws and customs. Travelers should be wary, especially if the locals view their city-state with aggression! Does your PC feel enmity towards a particular city-state? Have they visited any other city-states? If they hailed from Tyr, what do they make of the rumors that Sorcerer-King Kalak was assassinated and that freedom can be found there? In conclusion, city-states add a huge amount of variety to the Dark Sun setting. For players, the differences offer a wealth of background role-playing opportunities and as future adventuring opportunities. I am curious to hear if anyone has areas they would like to see covered, especially if they add value to the D&D Encounters experience. Do you want to know more about monsters? About terrain types? About the ecology? Weaponry and armor? Something else? This entry was posted on October 2, 2015 by Alphastream and tagged Setting, World-building.